Of late I have seen a lot of Elf on the Shelf “haters” so to speak and that is what prompted this post. Let me start out by saying that though my oldest child is almost 9 years old we did not get the Elf on the Shelf until last year. I honestly never heard of it until then or if I did I do not remember. And unlike you are supposed to do, I did not get ours until after Thanksgiving and we did not do things right. For example, I don’t think it was until months later that we watched the movie that we realized that adults are not supposed to touch the Elf either. So in our house it is OK for adults to touch her and we can hear what she has to say. Anyone over the age of 18 can. And you know what? That’s OK because it’s our Elf! I mean who the heck is the boss in our house anyways? Us or the dang Elf?! When we brought our Elf home we immediately collectively decided that her name would be Miss Chippy. Everyone was so excited by the idea of her in general but also because at that point I believe they even had an Elf in their classrooms! So this was really special to them because it was their Elf. Now, I’ll be honest, we did not do all these crazy ideas each night. The Elf was simply moved. Period, no biggie. And you know what, as scandalous as it sounds sometimes she didn’t move! So when the children woke up and noticed that she didn’t move we simply explained that she liked that spot and felt no need to move. And they accepted that; again, no biggie. If you don’t make a big deal about it neither will your children. So then what is the big deal with the Elf on the Shelf? Why do people think it is so stressful to move an Elf? I think because so many people out there now are so competitive that their Elf has to be the #1 Elf. Their Elf has to have the best spot in the house. However the Elf choses to return from the North Pole clearly has to be the best, the funniest, the most creative. If that is the case, well no wonder why you are so stressed out about it! I mean, I don’t know about you but I am not going to let a tiny little 10 inch doll stress me out! I mean, there are much bigger fish to fry out there, no? I have also heard that people think that the Elf is creepy. How is the Elf creepy? He or she is smiling; she has red lips, pretty eyelashes, and rosy cheeks. If she’s creepy then any doll in your house is creepy. Chucky, now he is creepy but the Elf? The Elf is not creepy unless you make him creepy just like we made Chucky creepy (on purpose). So if the Elf is not creepy and you aren’t stressed about moving the Elf what is the benefit of having an Elf? Is there one? To me there is. First off, the advertisement for this product is “A Family Tradition”. Maybe too many of us don’t have traditions anymore? Maybe we don’t believe? Maybe we have no faith? Maybe Santa doesn’t exist? Maybe it is only “Happy Holidays” now and maybe those holidays are just well, not happy for some of us? Well ok, but for some of us we do have traditions. We do believe. We do have faith. Santa is real! And ok, maybe after back-to-school Christmas is the most wonderful time of the year for some of us! And if all of that is the case then the Elf on the Shelf only enhances this time of year not only for the children but for us adults too. If it’s really a time of giving why not give the gift of joy to your children via a little Elf? Why is Christmas so special? Usually because it’s magical. Beginning with what our family says is the most important part of Christmas; the birth of Christ which for us is very really and yet also very magical, and then of course receiving gifts from Santa. But now, now the Elf is magical too! 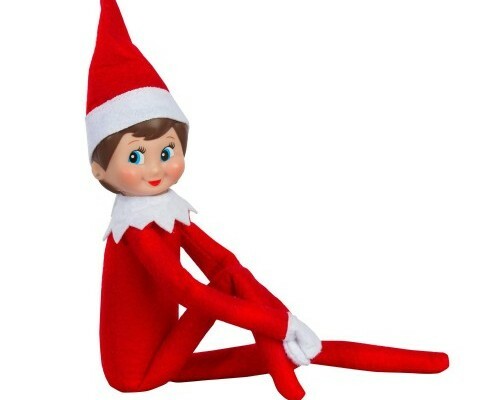 Can you imagine being a little child and thinking about how cool the idea of an Elf being adopted by a family, given a name, living your daily adventures with you and then going all the way to the North Pole every night to report back to Santa to come all the way back to your house each morning and having to search for her? And then, upon finding her you see that, just like us, sometimes she’s good and sometimes she’s naughty! I think that those concepts for a child are simply amazing! I personally have never had a bad day with the Elf. We wake up and like the advertisement says, the children rush around the house trying to find her. That’s better than any alarm clock or nudging to get them up and out the door for school! The downside is that they are a little too anxious to find her so they are up very early and I have not even had my coffee yet! But to see their little faces light up when they do find her and see what she’s been up to each night; that is priceless! To hear my one little 3 year old twin (who just recently started really talking) tell me or his twin, “Don’t touch Miss Chippy!” or see him wave to her like she is a part of the family is one of the best parts of my day. Why? Because most of the time our children no longer want to play with toys. They want an iPad or some type of technology or to watch TV. They play with a toy for a minute and they are onto something else. But Miss Chippy? Well they always want to engage her in their daily activities and that is something that I treasure. The fact that they invite her on our annual road trips to see the Christmas lights with us is so adorable even though I now need to deal with an Elf that needs to go potty! So, for the Elf haters, well, “haters gonna hate” and well, to each his own. But for me, when I wake up each night, in the middle of the night, as I always do, and I say to myself, “Oh crap Miss Chippy hasn’t moved” I will not have a panic attack but instead I will embrace the moment that I get to help be a part of something that is so very special in my children’s lives. I mean heck, would I rather be in bed sitting there thinking about all the things that I have to do – the dishes, the laundry, the cleaning, the work for my job and “etc., etc., etc.” or would I rather be setting the stage for my child to dream while he’s awake. I chose the latter.